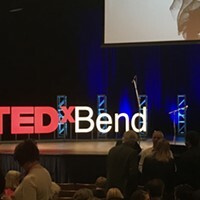 Here's the dilemma: The organizers at TEDxBend want to keep the list of speakers a secret until the day of the event. They want you to trust them. 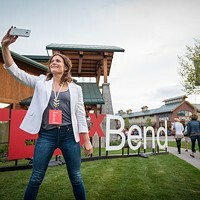 And, here's the problem: Even though the event isn't for another month, tickets for this year's TEDxBend, a day-long event of inspiring speeches and ideas, go on sale this Friday. Last year, they sold out in four days. This year, they expect to sell out even faster. Yup. You need to take a leap of faith. But we're here to help: The organizers gave us a peek at the list of speakers. And yes, they are impressive. And, what's more, they agreed to allow us to provide a sneak peek at two of those speakers. Each from very different backgrounds, but both incredibly strong and principled individuals who believe in the American dream, but perhaps in different manifestations. 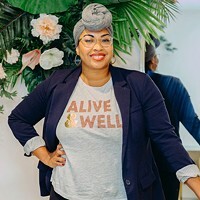 It is a storyline that would sound unbelievable if it were a Hollywood screenplay: Tchicaya Missamou was born in Brazzaville, the capital of the Central African country of the Republic of the Congo. For the first decade of his life, he lived in relative peace. But as a teenager, he was pulled, as a "child soldier," into a brewing civil war. Unrest was fomenting in the country—and Missamou was part of those disruptive forces, until he started his own militia that helped ferry white diplomats and businesspeople out of the country just as a brutal war was erupting. (Over the course of just a few months, that war claimed 10,000 lives.) But these missions were unpopular, and his family was attacked and tortured in retaliation. His mother was raped in front of him, and their home set on fire while they were inside. Three years later, in 2000, Missamou escaped to America—where he joined the Marines and served a six-month tour in Iraq before once again returning to the Republic of Congo to try and help his father, who had been arrested. But instead of rescuing his father, he was imprisoned himself and eventually shot during an attempted escape. Missamou will speak at this year's TEDxBend, and the Source recently caught up with him to discuss his life since the Marines—as a successful businessman who has launched a tough-as-nails fitness program, the Warrior Fitness Camp, and as the founder for Hope for Congo, a nonprofit that raises funds for his home country. His memoir, In The Shadow of Freedom, recounts many of the different turns in his life. Source Weekly: Given your past, it would seem as if you have given a lot of thought about what "family" and "home" mean. Can you provide definitions for each? Tchicaya Missamou: I thought at a young age that family is who you choose to surround yourself with. Your family does not always come from the same DNA. A man should be able to create a family wherever he is located. I was born in the Congo; I left my immediate family there but I was able to create a new home and a new family in America. My family is my wife and children, but also the community of "Warriors" we've created in our gym. SW: Are you ever homesick for the Congo? TM: When people ask me this question they get surprised with my answer. The country of my birth was never the country of my dream. Since the age of four, I dreamt of living in America. I was made in the Congo, and molded in America. I love both countries but I am not homesick. I am living the American Dream. SW: It is interesting that after spending years as a "child soldier," when you arrived in America you decided to join the Marines. Didn't you want to get away as far as possible from war? TM: The first white man I ever met was a Marine who was working at the U.S. Embassy in the Congo. When I asked him how could I be like him, he smacked the back of my head and said, "You will never be a Marine." When I became a child soldier, I was inspired by American war movies like Rambo, Delta Force, etc.... Two years after coming to America, I was approached by the Marine recruiter who helped make my dream a reality. On March 22, 2000, I went to bootcamp. SW: How do you define the "American Dream," and what barrier do you see most people have toward reaching that? TM: I was always fit since I was a child. My first job in America was a janitor at a local martial arts studio, and six months later I started training the students. In the Marines, I found myself training sailors and Marines when we got deployed overseas. I always wanted to be part of the solution, and not part of problem, especially when people asked me to help them lose weight so they can get promoted. One day, I was approached by two young ladies who asked me if I could get them in shape for a wedding. I started training them in my garage and, six months later, I could not count the number of people I was training. It was then that I decided to open a gym. For me, the American dream is the ability to follow your passion and to believe in the vision. If you love what you do, it's not called work. Most people have trouble reaching their greatest potential because they fear failure. They should know that failure is part of your success. SW: You have also started and manage the Hope for Congo Foundation. Can you share a success story from those endeavors? TM: I started the HCF to help the children in need. To inspire, motivate and empower people in Africa through education. Hope for Congo raised more than $800,000 worth of medical supplies to help the Congolese people who were affected by war. My team and I went back to the Congo to donate the medical supplies at the local hospital and met with the first lady of the Congo. SW: A common denominator from your pursuits seems to be a strong belief that leadership skills are essential for success. Who are some leaders that you respect? TM: I have respect for leaders like Gandhi, Martin Luther King, Jr., Mother Theresa, and Nelson Mandela. These people went above a nd beyond to create a better place for us. Read about TEDxBend speaker Nicole LeFavour here. Houston, We Have A Speaker!